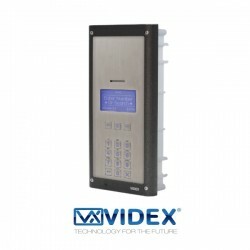 The digital GSM is the latest development from Videx, employing mobile phone technology to operate automatic gates, doors and remote site installations. 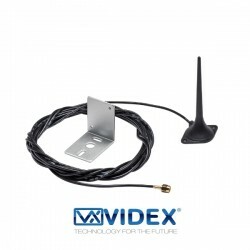 Based on the same technology as the GSM PRO series the digital GSM is available in the 4000 series style and vandal resistant option with the panel totally self-contained and only requiring an external power supply, antenna and standard size SIM card (not supplied by Videx). The digital GSM can call up to 500 apartments (users) each with a divert facility to call up to 3 additional telephone numbers should the first be busy or unanswered. 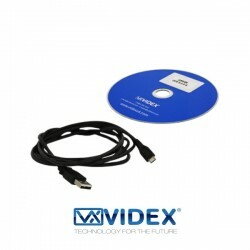 All variants include a large blue back-lit graphical LCD display (128×64 pixels) and blue back-lit illuminated keypad with either additional scroll buttons (4812R, VR4812R) or alpha keys A-F (4812, VR4812). Proximity access control is integrated as standard for up to 2000 users and a coded access facility is also available for 500 users. Up to 2000 telephone numbers can be stored to take advantage of the dial to open feature which enables callers to dial the digital GSM and release the door or gate without being charged for the call. Voice annunciation guides a visitor through the steps of making a call with the tenant to gain access. The large graphical LCD display can be customised for each installation and a company logo can also be uploaded to the display to greet visitors to the building. The name scroll option enables visitors to scroll through a list of names to find the company or person they are visiting or alternatively the visitor can type the apartment or unit number into the keypad to make the call. Additional features include a push to exit input, dry contact relay output, an auxiliary input and output and a trade timeclock input. All programming can be carried out by SMS text messages, via the on board keypad or by using the GSMSK PC programming software (connected to the digital GSM through a micro-USB or RS485 bus connection). An event log is also available to be viewed via the PC software for up to 8000 events.